I haven’t seen a real snowfall in ten years. In 2005, I left the winters of the north and landed in Texas, and when someone told me I would miss a good snowstorm, I insisted I would not. I was wrong. I have dreams about my college campus where it snowed from November to April, and every winter here in Austin, when the sky is gray and it’s cold enough to mimic a promise of snow, there is a book that I crave. I open to a random page and read until I’m sated. 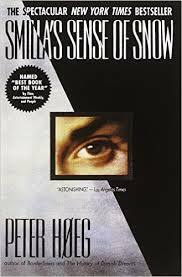 I have no memory of where I was when I first read the Danish thriller Smilla’s Sense of Snow (1993). I must have been in my early twenties, and someone must have given it to me because I would not have chosen it on my own. It had the look of a typical genre trade paperback, with a bold silver and black cover and the eye of a woman peering out from a small frame in the center. It was very unlike the version I read now, a twentieth anniversary edition with a more elegant font and a picture of snow-laden branches that more accurately captures the mood and beauty of this novel. Like most mysteries, it opens with a death, this one during a Danish winter. The victim is a six-year old Greenland Inuit boy named Isaiah who has fallen off the roof of his Copenhagen apartment building. As an adult, I have not been an avid reader of mysteries, but the mystery in this novel is not what kept me reading the first time, and certainly not what keeps me going back year after year. I go back for a sense of winter, and for Smilla, a misanthropic woman in her late thirties who cannot help infusing her narration with warmth and nostalgia. She is half Inuit, the daughter of an almost legendary female hunter and a Danish doctor who fell in love with her while on a medical expedition to Greenland. Smilla’s sense of snow comes both from her nomadic childhood in North Greenland and her studies in Glaciology as an adult. Smilla reads the footprints leading to Isaiah’s fall and begins to investigate his death. What is most interesting about the plot of this novel is how strongly it is contextualized by the colonial relationship between Denmark and Greenland, the exploitation of Greenland’s native population and resources, and the oppression of Inuit immigrants within Denmark. In my opinion, embedding a plot in its historical and political context always enriches a narrative, but is not used often or well enough in modern literature. In a way, Smilla’s Sense of Snow was a return to my first love. As a child, I read Nancy Drew books almost exclusively. Then I read the Famous Five series by Enid Blyton. These books were sent to me from India, where they were wildly popular and made many an Indian girl long for adventure in the English countryside. I read these books for the mood they evoked, for the feeling of being on holiday and coming across something slightly dangerous, slightly urgent, adventurism with time for a picnic. In adolescence, during the years that I began to think about what it meant to be a brown girl in America and to be considered foreign in the only home I knew, I read a few Agatha Christie books but found the genre no longer had anything to offer. She never kisses me, and she seldom touches me. But at moments of great intimacy, she lets me drink from the milk that is always there, beneath her skin, just as her blood is. She spreads her legs so I can come between them. Like the other hunters, she wears pants made of bearskin given only a rudimentary tanning. She loves ashes, sometimes eating them straight from the fire, and she has smeared some underneath her eyes. In this aroma of burned coal and bearskin, I go to her breast, which is brilliantly white, with a big, delicate rose aureole. There I drink immuk, my mother’s milk. I read passages like this with a sense of mourning. Will I ever again see water freeze into sheets of ice? My mourning is particular to my choice to leave the north, but it is similar to the mourning Zadie Smith describes in her essay on climate change, “Elegy for a Country’s Seasons.” It’s possible Smilla’s Sense of Snow describes a Danish winter that no longer exists. 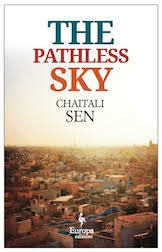 In that case, this novel is also a eulogy.